On the same day, we commemorate the Second Coming of our Lord Jesus Christ and His impartial Judgment. The most Divine Fathers placed this parable after the first two [those of the Publican and Pharisee and of the Prodigal Son], lest anyone, learning about God’s love for mankind in those parables, should live carelessly, saying: "God loves mankind, and when I cease from sinning, I shall be ready to accomplish everything." They set this fearful day here, in order to instill fear, through death and the expectation of future torments, in those who are heedless, and to bring them back to virtue, not trusting in God’s loving-kindness alone, but taking into account that He is a just Judge, Who will render unto each man according to his deeds. Moreover, since the souls of those who have died stood in our midst yesterday, it was fitting that the Judge should come today. In a certain way, the present Feast is, as it were, the consummation of all the Feasts, just as it will be the final day for all of us. 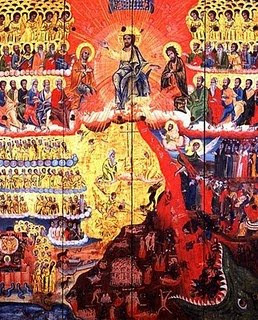 We should reflect that the Fathers will assign the beginning of the world and Adam’s fall from Paradise to the following Sunday, and that the present Feast is the end of all our lives and of this world. The Fathers assigned it to the Sunday of Meatfare, so as to curb greed and gluttony through the fear aroused by this Feast, and to summon us to show compassion to our neighbors. Furthermore, since, after reaping delight, we were exiled from Eden, and came under judgment and the curse, the present Feast is placed here, and also because, on the next Sunday, on which we commemorate the fall of Adam, we are going to be figuratively cast out of Eden, until Christ comes and brings us back to Paradise. Christ’s coming is called the Second Coming, because whereas He first came to us in bodily form, quietly and without glory, He will now come from Heaven with wonders that transcend nature, with conspicuous radiance, and corporeally, so that He may be recognized by all as being He Who first came and delivered the human race, and Who is going to judge it, to see whether it has preserved what was given to it. When His Coming will take place, no one knows; for the Lord kept this hidden even from the Apostles. But until then, at any rate, He indicated that it will be preceded by certain signs, which some of the Saints explained in greater detail. It is said that the Second Coming will occur after seven millennia have passed. Before Christ comes, the Antichrist will come. He will be born, as Saint Hippolytos of Rome says, from a harlot, who will appear to be a virgin, but will be of the Hebrew race, of the tribe of Dan, the son of Jacob; and he will supposedly live as Christ did, and will perform as many miracles as Christ, and will raise the dead. But all of these things—his birth, his flesh, and everything else—will be an illusion, as the Apostle says; and he will then be revealed as the son of perdition, with all power, with signs and deceitful wonders. However, as Saint John of Damascus says, the Devil himself will not be transformed into flesh, but a man who is the offspring of fornication will receive all the energy of Satan, and will suddenly rise up. He will appear good and gentle to all, and then there will be a mighty famine. He will supposedly satisfy the people, will study the Holy Scriptures, will practice fasting, and, compelled by men, will be proclaimed king; he will show especial love to the Hebrew race, restoring them to Jerusalem and rebuilding their temple. Before seven years have passed, as Daniel says, Enoch and Elias will come, preaching to the people that they should not accept him. He will arrest and torment them, and will then behead them. Those who choose to remain pious will flee far away into the mountains; when he finds them, through the agency of demons, he will make trial of them. Those seven years will be cut short for the sake of the elect, and there will be a mighty famine, and all the elements will be transformed, so that everyone will all but disappear. After this, the Lord will suddenly come from Heaven like lightning, preceded by His honorable Cross, and a river of boiling fire will go before Him, cleansing the entire earth of pollution. The Antichrist will immediately be seized, and he and his minions will be handed over to the eternal fire. As the Angels sound their trumpets, the entire human race will be gathered together from the ends of the earth, and from all the elements, in Jerusalem, because this is the center of the world, and there are set thrones for judgment, but with their souls and bodies all transformed into incorruption and having a single form, the elements themselves having been transformed into a superior state, and by a single word the Lord will separate the righteous from the sinners; those who have done good will depart, gaining eternal life, whereas the sinners will go to eternal punishment, and never will there be an end to their torments. It should be known that Christ will not be looking at that time for fasting, bodily hardships, or miracles, good though these things are, but for things that are far superior, namely, almsgiving and compassion. To the righteous and the sinners He will speak of six virtues: “For I was an hungred, and ye gave Me food; I was thirsty, and ye gave Me drink; I was a stranger, and ye took Me in; naked, and ye clothed Me; I was sick, and ye visited Me; I was in prison, and ye came unto Me; for inasmuch as ye have done it unto one of the least of these My brethren, ye have done it unto Me.” Everyone can do these things according to his own ability. Then every tongue will confess that Jesus Christ is Lord, to the glory of God the Father. 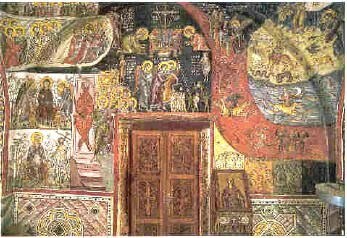 The torments which the Holy Gospel recounts are these: “there shall be weeping and gnashing of teeth, where their worm dieth not, and the fire is not quenched; and cast him into the outer darkness.” Clearly accepting all these things, the Church of God believes that the abiding of the Saints with God and the perpetual effulgence of His light and their ascent to Him are the delight of Paradise and the Kingdom of Heaven, and that alienation from God and the consumption of souls by the awareness that, through carelessness and temporal pleasure, they have been deprived of Divine illumination are the torment, the darkness, and the like. In Thine ineffable love for mankind, O Christ God, count us worthy to hear Thy desired voice, number us with those on Thy right hand, and have mercy on us. Amen. 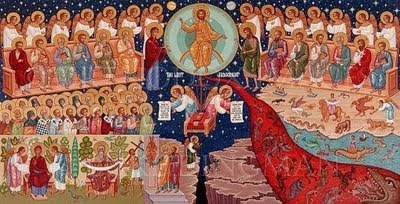 O God, when You come upon the earth in glory, the whole world will tremble. A river of fire will bring all before Your Judgment Seat and the books will be opened, and everything in secret will become public. At that time, deliver me from the fire which never dies, and enable me to stand by Your right hand, O Judge most just. Glory to the Father, and to the Son, and to the Holy Spirit; now and ever and unto ages of ages. Amen. Let us go before, O brethren, and cleanse ourselves for the Queen of virtues; for behold she hath come bringing to us fortune of good deeds, quenching the uprisings of passion and reconciling the wicked to the Master. Let us welcome her, therefore, shouting to Christ God, O thou who arose from the dead, keep us uncondemned, who glorify Thee, O Thou who alone art sinless.